At the UFCW, we know what makes our union strong: members standing together for respect and dignity in the workplace. In the grocery industry, union contracts guarantee protections and a voice on the job. But at the company with the most grocery sales in America, Walmart, our fellow workers are not receiving the respect they deserve. In the meatpacking and food processing industries, Walmart’s price pressures on suppliers can lead to downward pressure on workers’ wages. Our vision for American workers – in grocery, retail, and in our communities – is respect and dignity at jobs that pay fairly and guarantee workers a voice. This is the American Way, and it’s what made our country great. But Walmart has a different view – one where it, the employer, has all the power. Walmart creates poverty jobs: a worker earning the company-reported average full-time hourly wage working Walmart’s definition of full-time would be earning below the federal poverty level for a family of four. These jobs do not strengthen our communities or our nation. 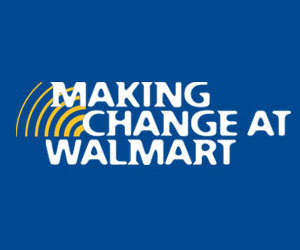 We are Making Change at Walmart. We are making change by working directly with Walmart Associates to claim the respect on the job they deserve. We are making change by holding Walmart corporate managers accountable to hourly employees and the public for their practices. We are making change by joining with community leaders in major cities across America to make sure that any new jobs offered by Walmart meet strong standards for healthy, growing communities.